Deitz, Shiloh, and Kristen Barber. 2015. “Geographies of inequality: urban renewal and the race, gender, and class of post-Katrina New Orleans.” Race, Gender & Class (January): New Orleans for Whom and What? Barber, Kristen, and Shiloh Deitz. 2015. “Missing in the storm: the gender gap in Hurricane Katrina research and disaster management efforts.” In Rethinking Disaster Recovery: A Hurricane Katrina Retrospective, edited by Jeannie Haubert. Lanham, MD: Lexington Books. Jackson, John, Charles Leonard, and Shiloh Deitz. 2016. “The climate of opinion in Illinois 2008-2016: roots of gridlock.” The Simon Review. Carbondale, IL: Paul Simon Public Policy Institute. Deitz, Shiloh. 2016. “Healthy communities in southern Illinois.” The Simon Review. Carbondale, IL: Paul Simon Public Policy Institute. Deitz, Shiloh. 2015. “Envisioning Carbondale’s creative community: current challenges and opportunities.” Paul Simon Public Policy Institute, November. Deitz, Shiloh. 2015. “Internet access in southern Illinois: results from the Jackson/Williamson County survey.” Paul Simon Public Policy Institute, July. Deitz, Shiloh. 2015. “Gender sensitive disaster policy in southern Illinois.” The Simon Review. Carbondale, IL: Paul Simon Public Policy Institute. In this paper presentation I will discuss a methodology for capturing spatial patterns in household level sociodemographic relationships. 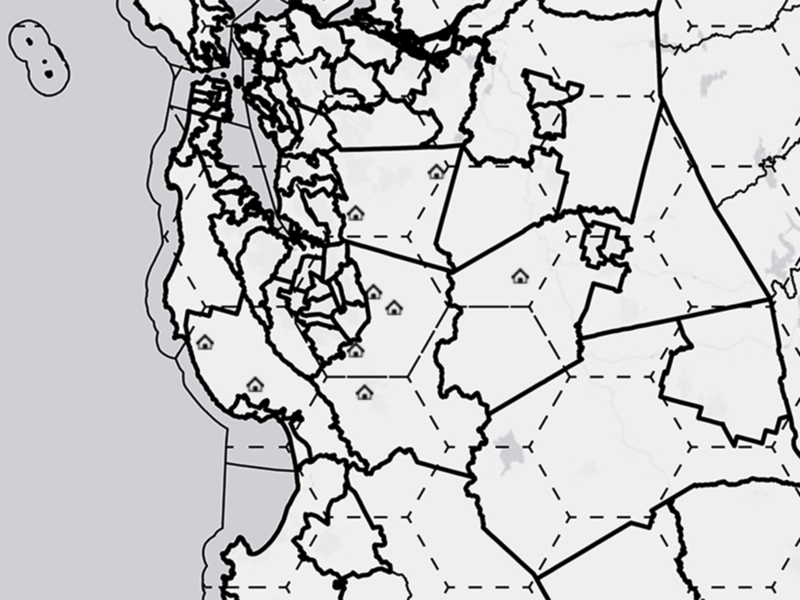 This paper explores and compares findings from aggregate analyses (Geographically Weighted Regression) at various census levels (PUMA, county, tract) to a new method that conducts non-spatial household regression then analyzes the results of those multiple regressions spatially. Founded in 1935, the Association of Pacific Coast Geographers (APCG) is one of the oldest regional organizations in the discipline. I presented the first paper of my PhD dissertation research at the APCG Annual Conference, held in the high desert city of Reno, Nevada. Household water insecurity is a recognized problem for sustainable and equitable human development. Previous research has identified key sociodemographic variables that explain poor infrastructure access for households, yet existing metrics lack a systematic consideration of geographic inequality and spatial variation. 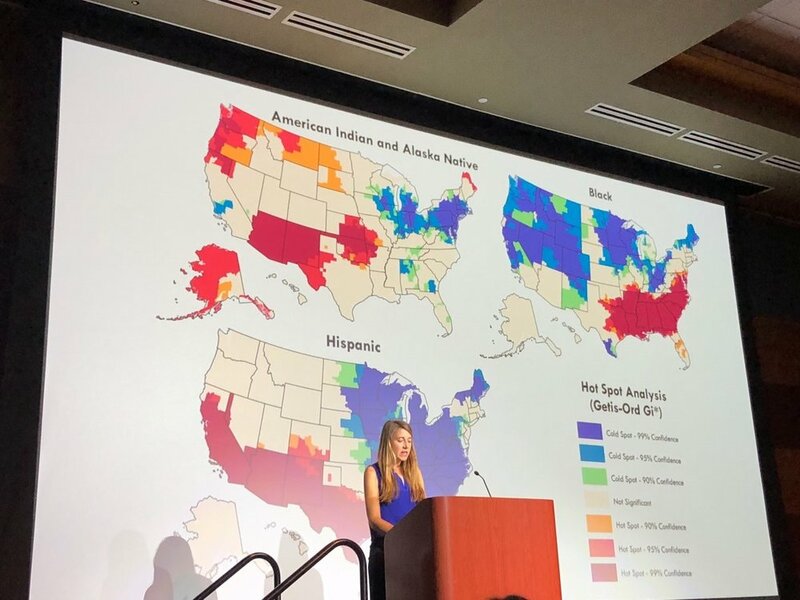 In this poster presentation at the Annual Meeting of the American Association of Geographers (AAG), I identify geographic hot spots of plumbing poverty and reveal its racial and spatial character.